We are excited to announce that APN Marketing Central is now available in Simplified Chinese. If you are an AWS Partner Network (APN) Partner in China, or a global APN Partner with a presence in China, the assets available in APN Marketing Central can help you go-to-market with Amazon Web Services (AWS). 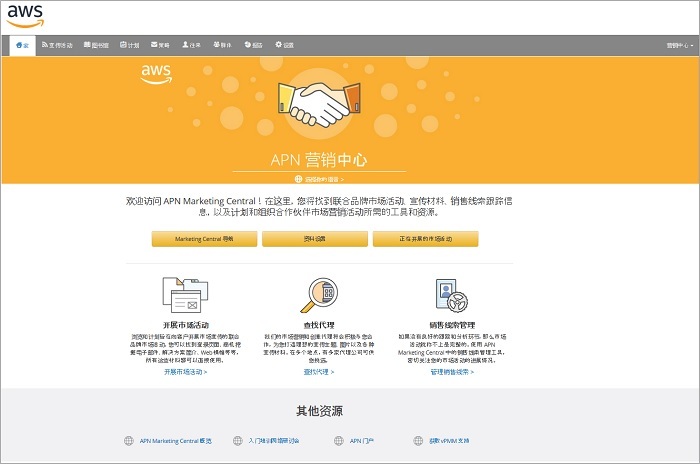 With APN Marketing Central assets, you can easily customize and launch co-branded marketing campaigns in Simplified Chinese with approved messaging from AWS. Whether you’re looking to supplement an existing campaign or launch a full-blown campaign, APN Marketing Central can help you generate demand for your solutions on AWS. APN Marketing Central is a benefit for all Standard-tier and above APN Partners and is available at no additional cost via Partner Central. We have launched two new campaigns in Simplified Chinese—Big Data and Cloud Migration. Big Data: Highlight your company’s big data solutions and how you and AWS can address customers’ big data needs. Cloud Migration: Outline what cloud computing is, why it’s relevant to customers’ organizations, and how they can begin their journey to AWS with help from your company. Each of these campaigns include three emails, a website landing page, copy blocks, case study templates, solution brief, web syndicated content, and banner ads in three sizes. Don’t have an APN Portal login? Create one using your company email address. To change your language preferences, on the APN Marketing Central home page click on Choose a Language >> Simplified Chinese, and then select your time zone. Be sure to hit save. To access the campaigns, click on Execute a Campaign >> Filter Language >> Simplified Chinese. If you want a personalized tour of APN Marketing Central, please schedule a call with our Virtual Partner Marketing Managers.